A whole bunch of announcements from Warner Home Video makes up today's news. There's a collection of repackaged Westerns; a box set of Paul Newman movies, boasting a new two-disc edition of Bullitt; a handful of Westerns made for Turner Network Television; and the return of the 'Salems Lot vampires. 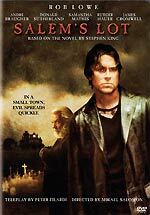 Even though it was made for television, the original 1979 mini-series version of Stephen King's novel Salem's Lot is widely regarded as one of the most successful adaptations of the author's work. The book was tackled again last year, for another mini-series, this time starring Rob Lowe, fresh from The West Wing, in the David Soul role, Donald Sutherland as Richard Straker (played by James Mason in the original version), and Rutger Hauer as Barlow (previously played by the late Reggie Nalder). The new version also features Homicide Life on the Streets' Andre Braugher, and Star Trek: First Contact's James Cromwell. Inexplicably the 1979 version is unavailable on DVD in the UK. Releasing it to coincide with this new version seems like an obvious move, but presumably Warner Home Video didn't want to confuse buyers, or invite comparisons between the two versions. It's too bad that a savvy retailer like HMV isn't pressing Warner Home Video to release a limited-edition double-pack. Salem's Lot - The Miniseries will be released on July the 11th. It will be presented in 1.77:1 anamorphic format, with 5.1 audio. The RRP is £15.99. There are ten films in Warner Home Video's Ultimate Westerns Collection, which will be presented in new, foil-embossed new uniform livery. They are: Cahill US Marshal, Chisum, Jeremiah Johnson, Maverick, The Outlaw Josey Wales, Pale Rider, Rio Bravo, The Searchers, The Wild Bunch and Wyatt Earp. The new discs are due on June the 6th, to coincide with Father's Day. Each disc has an RRP of £12.99. 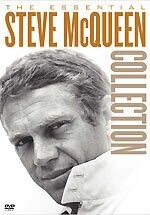 Warner Home Video will release The Essential Steve McQueen Collection on July the 18th. The set will include a new two-disc edition of Bullitt, which features three documentaries, including one that's new to DVD: The Cutting Edge - The Magic of Movie Editing, a look at the film editing process featuring input from Steven Spielberg, George Lucas, Martin Scorsese, Quentin Tarantino and Ridley Scott. It will also include a new documentary about the actor, Steve McQueen: The Essence of Cool, which includes contributions from McQueen's first wife, Neile Adams, Sir Richard Attenborough, Norman Jewison, son Chad McQueen, Peter Yates and Barbara Minty (McQueen's widow). Disc one will have a commentary track, by director Peter Yates, and will also feature the film's theatrical trailer. 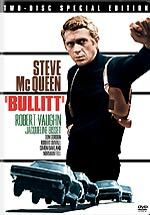 The third documentary is carried over from the existing disc: the 1968 promotional featurette Bullitt: Steve McQueen's Commitment to Reality. The film will be presented in 1.85:1 format, with Dolby Digital 2.0 audio. The other four films in the Collection are The Getaway, and three titles making their UK DVD debut: The Cincinnati Kid, Never So Few and Tom Horn. 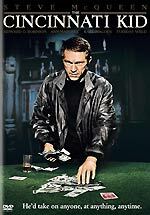 McQueen plays a poker player in 1965's The Cincinnati Kid, another film directed by Norman Jewison. The disc will feature a commentary by the director; scene-specific commentary by the David Foley and Phil Gordon, the hosts of Bravo's Celebrity Poker Showdown; an archival featurette, The Cincinnati Kid Plays According to Hoyle; and a theatrical trailer. The film is in mono, and presented in 1.85: widescreen format. The Getaway is already available on DVD, but this new set will add some bonus material to the offering: a commentary by DVD producer Nick Redman, authors Paul Seydor, Garner Simmons and David Weddle; a "virtual" audio commentary with stills, featuring McQueen, co-star Ali MacGraw and director Sam Peckinpah. The disc, which will feature the film in 2.4:1 widescreen format, with mono audio, will also include a theatrical trailer. The Getaway is another title likely to be spruced up for Warner's Peckinpah box set, but whether it will feature additional bonus features to those on this new version is unknown. Frank Sinatra stars in the 1959 McQueen film Never So Few, as the leader of a band of OSS operatives in WWII Burma. The film also features Charles Bronson and Peter Lawford. The film will be presented in 2.4:1 widescreen format, with Dolby Digital 5.1 audio. McQueen plays a man hired to prevent violence on a Wyoming cattle ranch in the 1980 film Tom Horn, one of the actor's last films. The film also stars Linda Evans and The Straight Story's Richard Farnsworth. The film film will be presented in 2.4:1 widescreen format, with mono audio. The new Bullitt Special Edition and The Getaway will be available to buy separately: Bullitt for £19.99 and The Getaway for £15.99. RRP for the five-title Collection set is £49.99. The US version of this set is due out on June the 7th. It will feature an additional film: Papillon, a title owned by Warner in the US, but by Columbia Tristar in the UK. It appears that the Papillon disc will be bare-bones, in contrast to the UK disc, which has a featurette, and an isolated score track (featuring a perennial favourite by Jerry Goldsmith). The UK disc is usually available for about £7. SRP for the US set is $68.92. 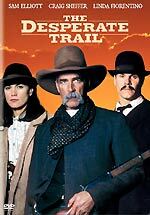 Ted Turner's enthusiasm for the Western has manifested itself in a number of productions over the years, and on July the 25th Warner Home Video will release three TV movies made for Turner Network Television: Conagher, Last Stand at Saber River and The Desperate Trail. 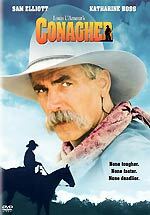 Two of the films star an actor who's career seems to have been defined by his fine moustache, Sam Elliott: Conagher, about the affair between a rough-ridin' cowhand and widower Evie Teale (The Stepford Wives' Katharine Ross), and The Desperate Trail, which features Nightbreed's Craig Sheffer as a conman and The Last Seduction's Linda Fiorentino as a condemned prisoner. 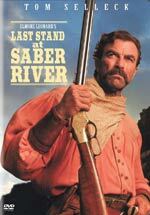 The third film, Last Stand At Saber River is based on a novel by Elmore Leonard, and features Tom Selleck as a pioneer who returns from the civil war to find that ne'er do wells David and Keith Carradine have taken possession of his home. Today is a very important day for telefantasy fans. The BBC are releasing a whole bunch of new titles today, including some titles that fans have been waiting for for decades: The Flipside of Dominick Hide / Another Flip For Dominick, The Invisible Man, The Day of the Triffids, The Nightmare Man and the Quatermass: Complete Collection. It's also a blue ribbon day for Hammer fans, with four titles due today: Mask of Dust, Spaceways and Stolen Face from DD Video, and Hell Is A City, from Cinema Club. Don't blame me if you can't find 'em in the shops! The Hammer DVD Guide has been updated accordingly. I'll add more detail when I get the discs. Ceri is away, so the Incoming page has only had a cursory once-over. I've checked that all the titles listed as coming out today are actually still expected today by the main e-tailers, and have added a few titles from announcements that were made last week. I've also added some information culled from last week's News entries. Titles that were expected this week, but seem to have been postponed, include Carla's Song (now 11/4) and the Gandhi - Special Edition (now 19/9). Finally, for those who haven't seen it yet, here, courtesy of the BBC Shop, is the sleeve for the first of the new Doctor Who DVDs, which is due on May the 16th. These releases won't have any bonus features: for those you'll have to wait for the box set, which will be released at the end of the year. Thanks to Mark Aldridge for the tip!